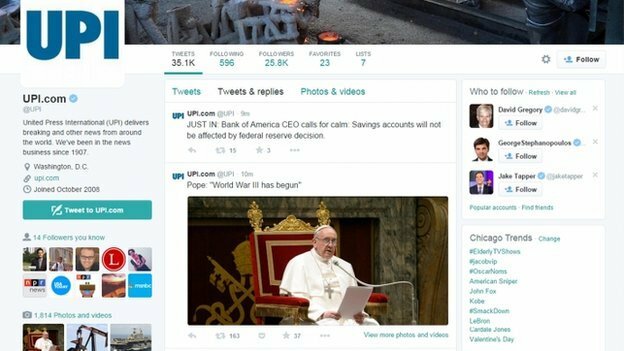 In one post, the Pope was quoted on UPI’s Twitter feed as saying that “World War III has begun”. Meanwhile, the New York Post’s account said that hostilities had broken out between the United States and China. It is the latest hack of a high-profile social media account, four days after US military command was compromised. UPI, which is based in Washington, confirmed in a statement that both its Twitter account and news website had been hacked. 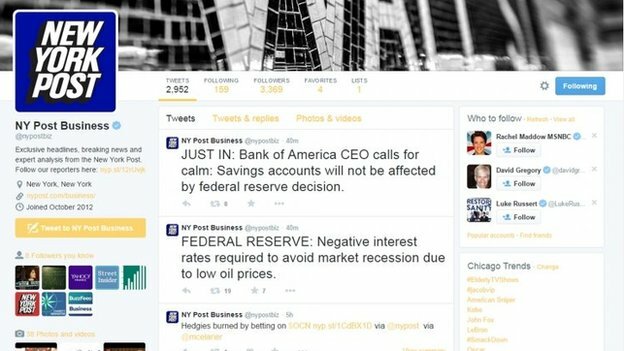 Six fake headlines were posted on its Twitter account and a breaking news banner was added to a fake story about the Federal Reserve on its homepage, the statement added. A tweet on the New York Post’s account said the USS George Washington, an aircraft carrier, was “engaged in active combat” against Chinese warships in the South China Sea. A Pentagon official said the tweet about hostilities with China was “not true”, AFP reports. The tweets have all since been deleted. The New York Post says it is investigating the hack. It comes just days after US President Barack Obama unveiled proposals to strengthen cyber security laws after a spate of attacks on high-profile US targets, including the Pentagon Twitter feed and Sony Pictures. The Twitter account of the US military command was suspended last Monday following an attack by hackers claiming to support Islamic State. In November hackers also released reams of confidential data stolen from Sony Pictures, and in recent years cyber criminals have attacked other US companies such as Home Depot and Target. A number of media organisations, including AFP and the BBC, have also been subjected to cyber attacks over the past two years.